Going to the big city can be a real treat, but it can also be scary for first-timers. That’s why it helps to have two furry and adorable puppies named Digger and Daisy to show young children just how it should be done. Then follows a flurry of shopping, during which they look at hats, shoes and dresses – all activities that interest Daisy and bore Digger to near-tears. He doesn’t want to look at hats or shoes or dresses. But he does find something he wants to examine more closely: a toy shop with dump trucks, cars and fire engines! Now Digger is interested in stopping to look but Daisy is not. And when she walks on ahead, they become separated. Someone gets lost. The only question is which one? 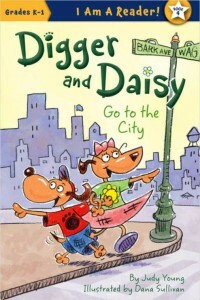 This next installment of the Digger and Daisy adventure is like welcoming back an old familiar friend. 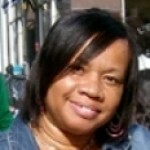 Though Ms. Young’s prose is short, sweet and to the point, it still manages to brim with humor. And as always, artist Dana Sullivan’s illustrations showcase round, innocent eyes, and wide, adventurous smiles against a backdrop of bright and defined colors. Aside from the sheer joy of purchasing this book solely as an addition to your child’s library, it might also be used to introduce the subject of following directions, staying together when on an adventure, or simply taking turns so that everyone gets a chance to do what they like.